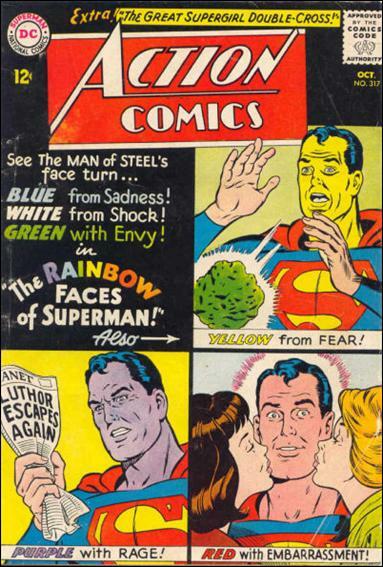 Superman in "Superman's Rainbow Face!" Written by Otto Binder, penciled & inked by Al Plastino. *Superman is exposed yet again to a piece of Red Kryptonite; this time his emotions now may lead to his downfall. An untitled Tricksy the Stunt Man strip. Written, penciled & inked by Henry Boltinoff. *Tricksy shows off with a stunt involving his teeth. *Casey nabs a thief during a botched crime. Supergirl in "The Great Supergirl Double-Cross!" Written by Leo Dorfman, penciled & inked by Jim Mooney. *Supergirl, upon learning that Lena Thorul's new boyfriend is an enemy spy, tries her best to break up the pending engagement between the two. Cover art by Curt Swan.